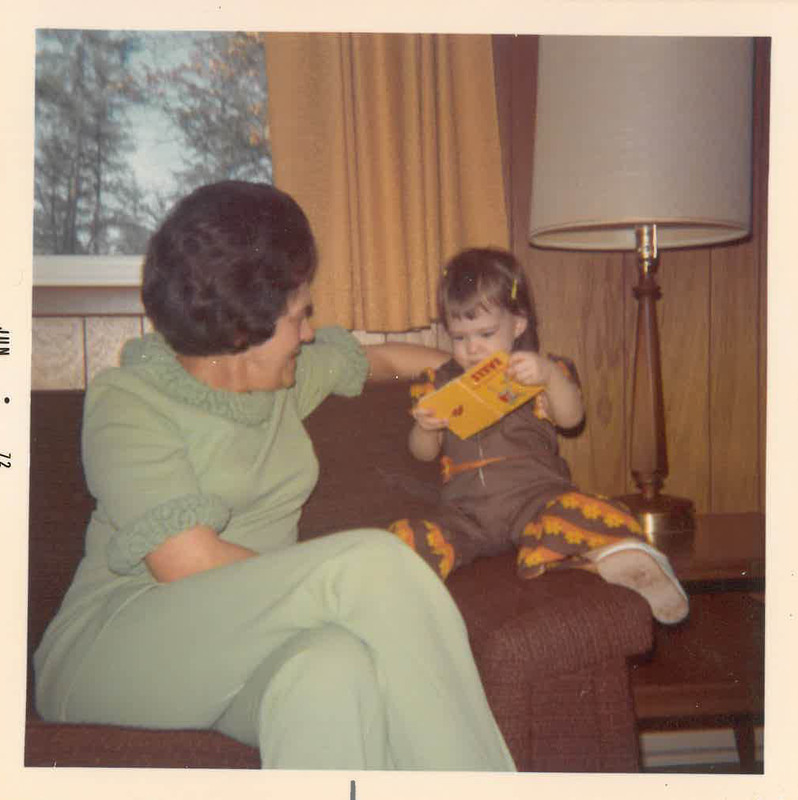 In 1972, Julie L. Davis and her grandmother discuss the merits of good storytelling. In the last years of her life, a conversation with my grandmother inevitably led to her asking me, "So how is The Book coming?" Each time, the question filled me with love and anxiety—love for her unflagging support, anxiety because usually, it wasn't going all that well. Since it was only was a Ph.D. project at the time, calling it a "book," out loud and in capital letters, also seemed presumptuous. "It's just a dissertation," I would insist. In fact, I really did think of it as a book all along. This allowed me to believe that someday, someone might want to publish it. It suggested that it might have readers beyond my dissertation committee. Above all, it meant that it was going to tell a good story. 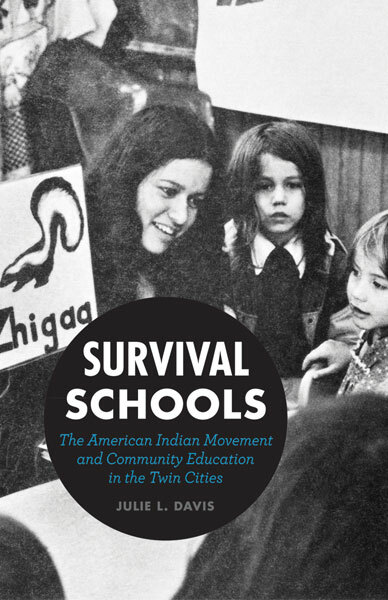 With the publication of Survival Schools: The American Indian Movement and Community Education in the Twin Cities, The Book actually became a book. Throughout the long process of research, writing and revising, I maintained my commitment to crafting a compelling narrative while also making a scholarly argument. In History: A Very Short Introduction, John Arnold defines history as a process of telling "true stories about the past." The truth and the story are equally important to writing good history, especially if we want it to reach beyond an academic audience. Historians pursue truth by studying fragments of the past found in our sources and analyzing them in context. In academic writing, we convince colleagues that our interpretations are valid by building logical arguments through debatable claims, supported by verifiable evidence. But there are other sorts of truth by which we might measure a work of history. Does it render the past comprehensible? Does it make it meaningful? Can it help us understand what it was like to live in that other time and place, and would it resonate with the lived experience of those who inhabited it? Might it help us empathize with people in circumstances very different from our own? Here's where the story part comes in. Effective historical narratives don't just put events in chronological order. They humanize the past. They help us get inside other people's skins. They move us. Thus they provide a sort of experience-truth, an emotion-truth—what novelist Tim O'Brien calls in The Things They Carried "story-truth." Unlike O'Brien, historians can't make things up in order to get at this kind of truth; we have to base our interpretations on the evidence provided by our sources. We can, however, seek the story in the sources, and give it space in our writing. Providing that space is challenging for scholars whose work also must pass academic muster. Even in history, a relatively narrative-friendly discipline, peer evaluations of our work depend more on the strength of the argument than the skill of the storytelling. As an academic, I spend most of my time constructing and deconstructing arguments, defending and dismantling them, and teaching students to do the same. As a public scholar, however—one whose goal is to foster historical understanding outside the classroom and beyond academia— I'm convinced that if we want our work to engage wider audiences, if we want it to shape opinions or shift perceptions, and if we want it to capture the emotional truths of human experience, historians need to give at least as much attention to telling stories as we do to constructing arguments. My conviction is supported by research on the science of storytelling. In The Storytelling Animal, Jonathan Gottschall concludes that storytelling is "central to the human condition." This is because our brains consistently "force narrative structure on the chaos of our lives." As neurobiologist Andre Fenton recently explained, what we call a "memory" is a story our brains construct from the various components of a past experience. Because of this hardwiring, Gottschall has written, “our attitudes, fears, hopes, and values are strongly influenced by story. In fact, fiction seems to be more effective at changing beliefs than writing that is specifically designed to persuade through argument and evidence.” Research suggests that this also holds true for nonfictional narratives. When writing Indigenous history, it's especially important to respect the power of story. Stories long have been central to Indigenous knowledge and communication systems, including interpretations of the past. As expressed by Niigaanwewidam James Sinclair in Centering Anishinaabeg Studies: Understanding the World through Stories, Anishinaabeg stories are "vessels of intellectual life. They are methods." Jill Doerfler adds that "stories are theories." Anishinaabeg storytelling is imaginative and generative, as well as intellectual and philosophical; as Doerfler writes, "we create ourselves with stories." In Survival Schools, I used oral history to create both a convincing argument and an engaging narrative, to tell a true story about the Indigenous past. The interviews I conducted with founders, parents, teachers, and students were essential primary sources providing otherwise inaccessible information, and I use them as evidence to support my claims. As personal narratives, fashioned from individual memories and communicated in conversation, the interviews also steep the book in story. Building the book on a foundation of oral history and weaving the interviews through the text helped me tell a human story about Indigenous history. I hope that it helps readers understand that history, and rings true for those who experienced it. Julie L. Davis is author of Survival Schools and associate professor of history at the College of St. Benedict/St. John's University. "For the first time, Julie L. Davis gives us an essential view of one of the American Indian Movement’s most audacious and long-lasting achievements: the creation of schools for the lost Native kids of Minneapolis and St. Paul. Sympathetic but never sentimental, she captures the righteous anger, new-found hope, and rugged determination that turned dreams into reality." Good post and that is a cute pic, the one at the top!